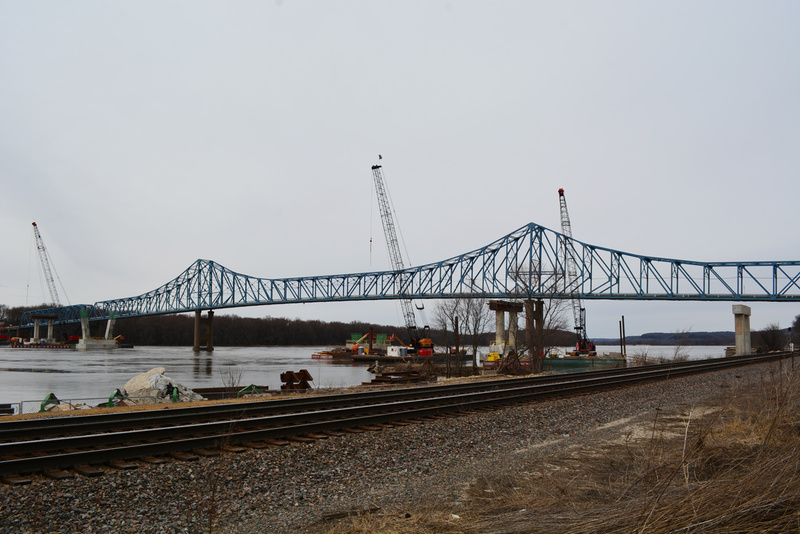 Supports for the Dale Gardner Veterans Memorial Bridge rise from the Mississippi River during construction to replace the Savanna-Sabula Bridge. Photos taken 03/12/17. U.S. 52 travels through northeastern Iowa from the Dale Gardner Veterans Memorial Bridge across the Mississippi River at Sabula to Minnesota north of Decorah. The 167-mile route in the Hawkeye State is a part of the Great River Road north from Sabula to Dubuque, and again through Guttenburg. The Southwest Arterial is a new 6.1-mile freeway under construction for U.S. 52 around Dubuque. The four-lane alignment will angle northwest from U.S. 61/151 at Dubuque Technology Park to Dubuque Industrial Center West and U.S. 20 near Dubuque Industrial Center. A dumbbell interchange along the highway will connect with a new road linking English Mill and North Cascade Roads. The $157 million highway will open initially with two lanes in 2019. The Iowa Department of Transportation (IowaDOT) will fund the remainder of the $17.4 million needed to complete the four-lane project at a later date. US 52/IL 64 over the Mississippi River. IDOT project website. "State approves Dale Gardner Veterans Memorial Bridge." Carroll County Mirror Democrat (IL), June 2, 2017. "New U.S. 52-Illinois 64 Bridge Opens in Savanna." State of Illinois, news release, November 17, 2017. 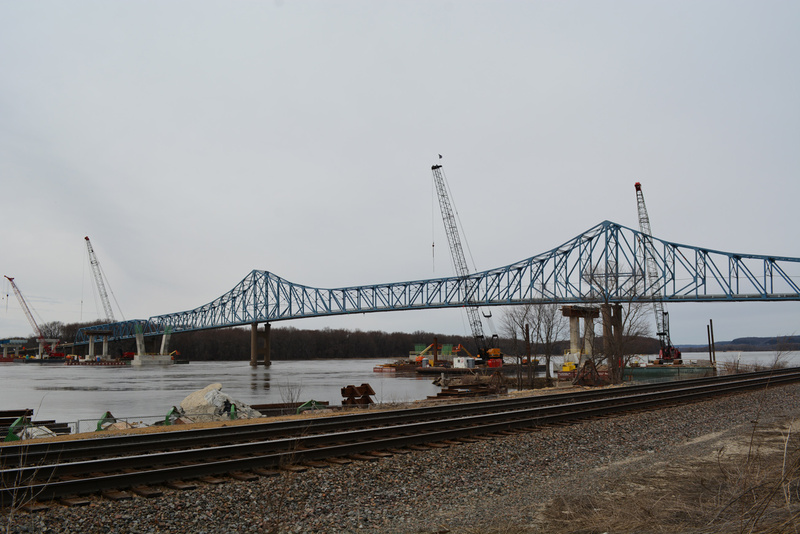 "Relive the Savanna-Sabula bridge demolition from multiple angles." WQAD (Moline, IL), March 9, 2018. 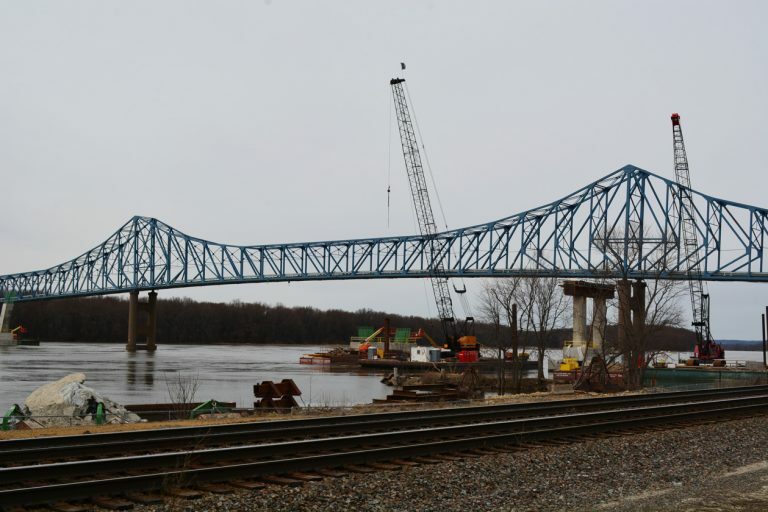 "Bridge between Savanna, Sabula closed until late May." Quad-City Times, February 27, 2018. "Savanna bridge opening delayed until Labor Day." WQAD (Moline, IL), May 11, 2018.